There was once a time when I ate three cookies before 11 am. It was just one of those days. And I had not had a cookie in forever. Which probably isn't 100% true but I like to be dramatic every once in a while. I like to give baked goods as gifts. 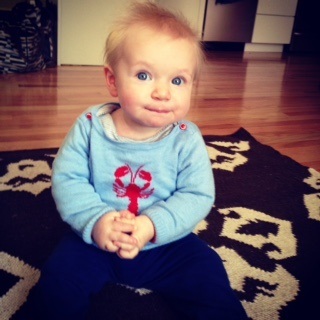 After receiving all sorts of baby clothes and toys from a family I wanted to send a baked thank you. I was challenged by the fact that one one of the daughters has Celiac disease. Not wanting to simply get gluten free flour I researched some recipes for coconut flour. After finding what seemed like a winner I whipped it up. Of course you cannot just hand over cookies without out tasting them first so I tested one out. And then tested a few more. Mr. J doesn't think they are cookies and no if you want a tried and true chocolate chip cookies these will be a disappointment. However they are good, especially if you like coconut. I wouldn't recommend eating three at once. You might get a stomach ache. Consider yourself warned. Add in chocolate chips until they are evenly distributed throughout the cookie dough. Use a tablespoon to portion out the cookie dough onto your baking tray. Pat down the cookie rounds with to form them into the shape you desire (the mixture will not spread out). I left mine in rounds to have a more doughy center. Place your cookies into the center of the oven and bake for around 10-15 minutes, depending on the texture you want. I removed mine after 12 minutes. Cool on a wire rack for 10 minutes if you have one. Since I started back at work in June I have been working from home on Wednesdays. I am pretty against merging the lines between work and home. I have always tried to keep work, at least the act of doing work, at the office. However, I have come to realize there are some benefits from having a home office. Mainly I don't shower on Wednesdays. Is that too much information? The extra time from not having to get ready in the morning and drive to work is amazing. Mr. J takes Miss O to daycare and I have a solid 20 minutes to do laundry, wash dishes, brush my teeth. I am still rushing but for whatever reason it is not stressful. Another reason working from home as been nice is my lunch time. I can go see Miss O at day care and have a hot lunch. When I am at the office I have to race to see Miss O and then end up stuffing my face in front of the computer. It may or may not be hot. And the hotness is not dependent on whether the said food should be hot. Most of the time I just don't have the time to wait for it to microwave. This month for the Secret Recipe Club I had Our Good Life by Terri. We have been eating a lot of butternut squash lately after a surprise delivery of Fall garden treats from the In-Laws. I love butternut squash plain and simple but am always looking for ways to jazz it up from Mr. J. When I saw this quesadilla recipe I knew we would both love it. Plus it was super easy to throw together during one of my stay at home lunches. Place the tortillas on the cookie sheet. Place 1/4 c acorn squash, 1/4 of the bean mixture, and cheese. Fold over the tortilla to cover the filling. Broil until the top is golden brown, about two minutes. Serve with salsa and lime wedge. One of the things I look forward to each year is The Great Food Blogger Cookie Swap. Five years ago two great bloggers decided to do a little good each holiday season with some cookies. Love & Olive Oil and The Little Kitchen started a cookie swap raising money for COOKIES FOR KIDS’ CANCER. The event gets bigger each year and is even international. If you like to bake and have a blog check out their website and sign up. The bigger the better. Oh my goodness. I blink and months fly by. This is the view from our back door. I love Fall. How did it become Fall already? And although the leaves are a pain to rake up, the leaves are just too beautiful to complain. I have a whole bunch of updates and thought I would do a brain dump today. So let's sit down with a cup of coffee and do a little chatting. My little munchkin turned 7 months old. I cannot believe it. She is starting to be much more like a little person than a baby. She has two teeth. The two middle bottom teeth came in at the exact same time. Between those teeth and a cold we had a rough go of it for a while. Mostly though she claps, talks and laughs all of the time. We also started food. It took about 3 times of hating it before she really loved it. Now she is a champion eater. We do lots of pureed veggies of all sorts, bananas and applesauce. Applesauce is the favorite. She is also a champion of getting food everywhere. I don't even know how she gets food where she does. And despite my best abilities to clean up I still find food dried up on her hours later. Thank goodness for baths. She doesn't crawl yet but can get up on all fours for minutes. She scoots backwards or rolls over and over again to get where she wants to go. I am still trying to figure out this whole mom/work/life balance. I am beginning to think it doesn't exist. Each day I can be one but never can I do all three. There just isn't enough time and in the end I am never satisfied with how I spent my time. Miss O takes up so much energy and effort; when she is around that is all you can do. Not that it is a tough job; she is so stinking cute. However, multitasking with her only means failures. I have burned lunches; cookies, forgotten about laundry and a bunch of other things that aren't worth mentioning. At this point I know not to even bother. We are still having lots of fun though. She can now sit up in the stroller without a car seat. She loves watching everything, especially big kids playing. I cannot wait for our town trick or treat event for Halloween. Our kitchen is still a work in progress. We slowed down big time once it became function. We are still missing flooring in one of the hallways, our mud bench/storage area is an open nook, the back splash needs installing and we have some painting to do. Overall though it is in great shape and we love it. Now it is just the finishing touches before the little one becomes really mobile. So that is pretty much it right now. Busy, busy, busy with work, baby and house. I feel fortunate to have all three no matter how hectic life can get. 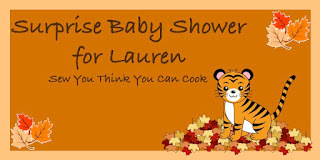 Today we are celebrating a very special day for Lauren of Sew You Think You Can Cook. She is expecting a little one in November. A group of us bloggers are celebrating this Mama with a virtual Baby Shower thanks to the planning on Tara. I have the pleasure of knowing both of these ladies from The Secret Recipe Club. We have all been members for quite a while and have gotten to know each other from our monthly postings. Lauren loves Thanksgiving and we wanted to give her some love via our favorite Thanksgiving recipes. For me Thanksgiving is a big relaxing day with family. Starting with a slow breakfast and watching the parade on TV after the turkey is in the oven. These oatmeal maple scones are super easy to make the morning of but are also delicious if you make them the night before. You can put out a big platter for everyone to take as they please. And the big plus is there are not too filling (that is if you can stop at just one). You will still have plenty of room for your turkey dinner. I hope Lauren feels the extra love and support as she enters her final stretch of this pregnancy. I know from recent experience that this final push to the end is the hardest. Help me in wishing the very best to Lauren and her family! In a large bowl, whisk together the flour, oats, sugar, baking powder, soda and salt. Add the butter and using a fork or a pastry blender mix it together and combine until the butter forms coarse crumbs. This step will take a few minutes. Make a well in the center and add in buttermilk and vanilla extract. Mix with a large spoon until a dough forms and comes together. Place the scones on a baking sheet and bake for 10 to 12 minutes. Remove from oven and cool on a wire rack. Once cooled frost with the glaze and a few oatmeal flakes before serving. Whisk together the ingredients until smooth. If the mixture is too thin, whisk in more sugar 1/4 cup at a time. If it's too thick, whisk in more milk until you have the right consistency. Drizzle on top of scones. Here are the other recipes for Lauren! This recipe had me licking my fingers all night long. I used this frosting for the Mississippi Mud brownies I made yesterday for #Choctoberfest. There was some leftovers and my husband had the brilliant idea of topping some chocolate chip banana muffins. Instant cupcakes. It made me think that having frosting on hand at all times is a pretty good thing. Cook butter, milk and unsweetened cocoa over medium heat in a large saucepan, stirring constantly, 4 to 5 minutes or until butter melts. Remove from heat, and beat in powdered sugar and vanilla at medium speed with an electric mixer until smooth. Happy Wednesday! I don't know about you but it seems to me like this week should be over already. Monday and Tuesday have been super busy with work. I missed my little one so much. It was nice to not have to run out the door this morning. This morning was also good because I have a pan of these Mississippi Mud Brownies. I made these up for #Chocotoberfest. They are probably some of the most decadent brownies I have ever made. Super chocolatey, packed full of walnuts, topped with marshmallows and then covered with chocolate buttercream frosting. Oh my! There are several ways to make Mississippi mud desserts but I am pretty sure brownies are the way to go. Also, marshmallows. You can used whipped topping but for me nothing beats the stringy marshmallow gooeyness. I hope you enjoy and be sure to check out all of the other #Chocotoberfest recipes below. Preheat oven to 350°. Bake walnuts in a single layer in a shallow pan 6 to 8 minutes or until lightly toasted and fragrant. Microwave chocolate and butter in a large microwave-safe bowl at HIGH 1 to 1 1/2 minutes or until melted and smooth, stirring at 30-second intervals. Whisk in sugar and eggs until well blended. Stir in flour. Spread batter into a greased 13- x 9-inch pan. Bake at 350° for 25 to 30 minutes or until a wooden pick inserted in center comes out with a few moist crumbs. Sprinkle warm brownies with toasted pecans and marshmallows and bake for an additional 5 minutes until marshmallows are slightly baked and browned. Prepare Chocolate Frosting. Pour over pecans and marshmallows; spread to edges. Let cool 1 hour on a wire rack. Cut into squares. Are you a blogger who is interested in joining us during out next community event?